One of Australia's last remaining piano-maker has just created an instrument the likes of which the world has never seen. 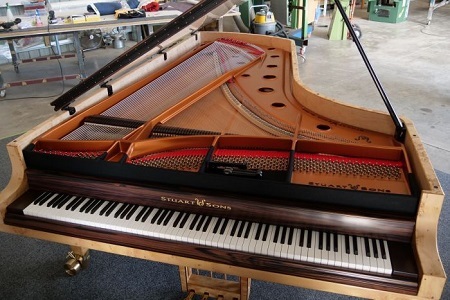 Most grand pianos have 88 keys but Wayne Stuart's family-run business in Tumut, southern New South Wales, has built the first known piano with an impressive 108 keys. This means it boasts a nine octave range, unheard of on the piano until now. "We need new horizons and this is certainly a new horizon." Mr Stuart has been handcrafting pianos for 40 years but this is by far his most ambitious creation. Made with ancient Tasmanian Huon pine, the masterpiece measures 3 metres in length and took 18 painstaking months to build. "We've got an awful lot of strings and they needed to be supported," Mr Stuart said. "Also, the performance culture has changed a lot and increasingly, pianists are stretching into the piano and playing on the open strings. "You only get one hit with things like this and you've got to get it right, and I think we've made a pretty good fist of it." The result, according to Mr Stuart, is a grand piano that feels and sounds more like an orchestra than an instrument.